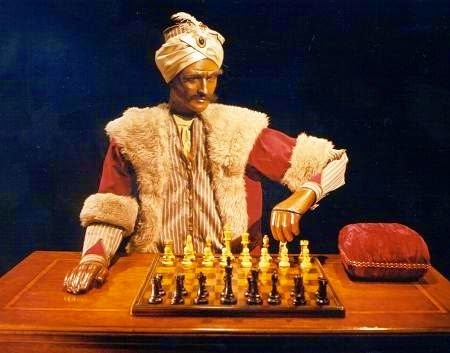 Here is Wolfgang von Kempelen's famous chess-playing automaton, the Turk. There is loads and loads written on it. This account of the Turk's tour to Paris in 1783 and its encounter with the great Philidor is taken mostly from Thomas Standage's book of 2002 The Mechanical Turk (p.42-46). The Turk of course was a fraud. Its complex clockwork merely governed the figure's chess playing arm - the moves were determined by a player cunningly concealed within the elaborate wooden cabinet. From our vantage point, it seems remarkable that intelligent 18th-century men - Napoleon included - could ever have entertained the possibility of a chess playing automaton worked by nothing more sophisticated than cogs, cylinders and wheels. Admittedly most were convinced there must be a trick, but they still took pleasure in its ingenuity. Modern historians have written of a "will to be baffled"; despite the endless attempts to expose the secret of the Turk, the late Enlightenment wanted to believe, to substitute the wonders of science for the magic of old. Nonetheless the automaton's Austrian creator must have viewed with some trepidation the prospect of Paris, for here the Turk would be subject to the scrutiny of the Academy of Sciences - to say nothing of facing the most impressive chess players in Europe. The party went first to Versailles where Bachaumont concluded in his journal that the Turk was a much superior spectacle to Vaucanson's digesting duck and flute player since "it performs not just physical motions, but elevated intellectual functions." He reported that the duc de Bouillon had beaten the Turk, which had been overconfident, but nonetheless demonstrated "intelligence and some impressive moves". Such was the enthusiasm for "Mr.Anthon and his automaton" at Court, that its debut in Paris was delayed until the beginning of May, when it finally went on public display. A small admission fee was charged and challengers were invited. On 6th May it was defeated by a lawyer named Mr Bernard, before a distinguished audience which included the marshal de Biron and the marquis de Ximenes. According to Grimm, Bernard acknowledged that the automaton was a resourceful player, possibly of the third or fourth rank and, singled out the portly marquis de Ximenes, to his utter mortification, as a player of similar abilities. Grimm noted that the Turk was capable of the Knight's Tour, a complex strategy which even the great Philidor had failed to master. Although he was convinced there must be some human operator, he too pronounced the Turk superior to Vaucanson's flute player and marveled that "physics, chemistry and mechanics" had produced wonders inconceivable to past ages of "superstition and fanaticism". Among the Turk's most illustrious opponents in Paris was Ben Franklin, who was invited to play privately in Kempelen rooms at the Hôtel d'Aligre; he was defeated but took it with good grace and, according to his grandson, greatly enjoyed his game. Meanwhile the public performances continued. On 24th June the duc de Croy recorded seeing the Turk and pronounced it a "most charming contraption". It probably appeared at the Café de la Régence where it was beaten by the now-elderly Legall; but only one player really counted: Paris eagerly awaited the return of Philidor from London to take on the Turk. According to Philidor's son André, his father was approached the day before the match and asked to allow the Turk to win; he agreed provided that the Turk put up a strong enough opposition to make his defeat seem plausible. In the end he won easily, but the event was still a public relations triumph for Kempelen. It took place shortly after news of the first Montgolfier flight had reached Paris, in the presence of several members of the Academy of Sciences and excitement was high. The audience declared itself bemused; according to the Journal des savants "the manner in which the maker influences his machine during play is so adroit and so well hidden that a large number of savants who saw it in Paris were not able to divine the means by which it was done". As to Philidor, he seems to have believed that the Turk was entirely genuine and was understandably disconcerted by the idea of a chess-playing automaton; he pronounced that no game against a human opponent had fatigued him to the same extent.